Despite being a fairly basic centreweighted, I’m impressed by the accuracy of the M9’s metering, with a few fairly obvious caveats. All centreweighted systems are prone to exposure errors when presented with subjects that are predominantly light or dark and the M9 is no different. When used with care and common sense, though, the M9’s metering is very reliable. 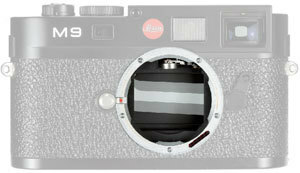 The M9’s TTL metering system is centreweighted only, although in a change from the M8, which had a single grey band, in the M9 a pattern of white and grey bars is printed on the shutter blades. A light sensor in the camera’s throat measures the light that reflects from these bands to determine exposure. Leica’s first attempt at a TTL metering system was built into the ill-fated M5 of 1971, and featured a metering cell suspended in front of the shutter on a pivoting arm. The M9’s system is simpler and much more resilient, and very reliable in most situations.